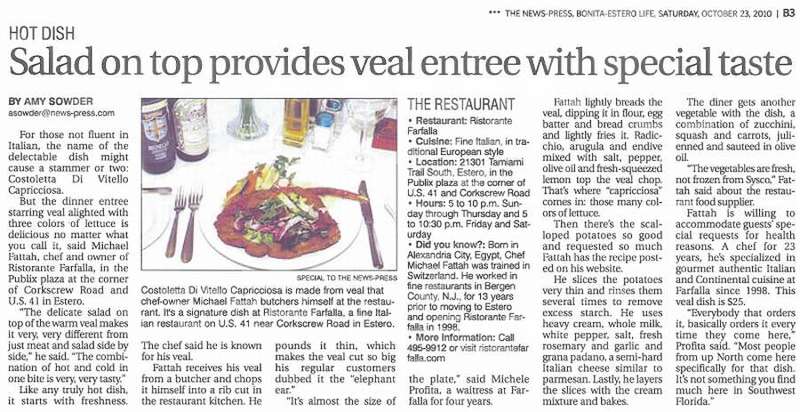 "From the extensive list of hot and cold antipasti, we settled on the Carpaccio Alla Florentina - wafer-thin slices of filet mignon with arugula, caper and shaved Parmesan. Dressed lightly with olive oil and lemon juice, the beef was tender and lean; and the slightly salty touch of cheese and caper played nicely off the bitter note of the greens. All in all it was a surprisingly light start for the meal." "From the "pesce" portion of the menu, we opted for a filet of red snapper (Filetto Di Dentice Al Cartoccio), which was delicately seasoned with garlic and basil and topped with tomato slices. Since it was wrapped and baked in parchment paper, the fish maintained its natural sweetness and moisture while flaking easily with the fork. This is the sort of simple preparation that lets a really good piece of fish shine, and Farfalla's chef apparently knows it." "We went with Capellini Mare e Monte. From our long-ago Italian lessons, we figured that translates roughly as "surf and turf" with noodles. More precisely, its angel hair pasta with shrimp (surf) and wild mushrooms (from the turf). While there were only four shrimp clinging to the mound of al dente capellini, they were pleasingly plump and tender and complemented by bits of garlic, plum tomatoes, arugula and porcini. It was just the right amount of food, too. " 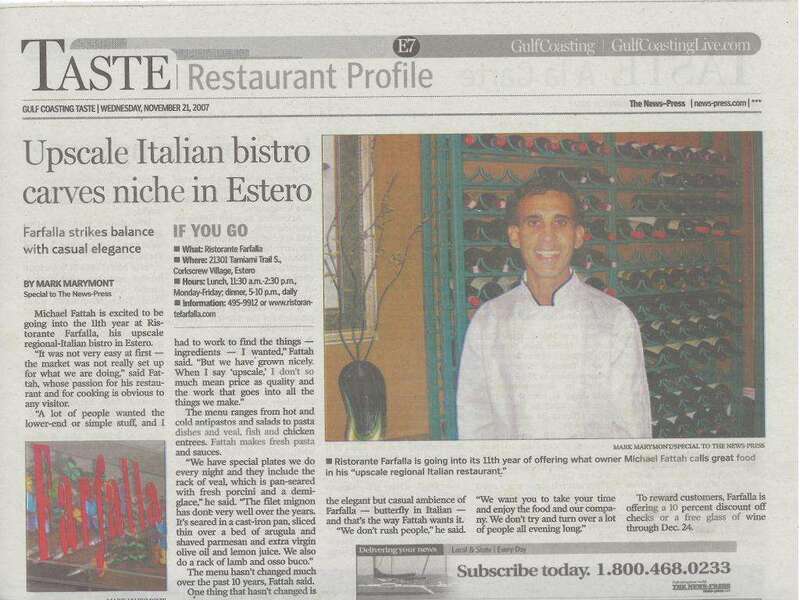 "With such fine food and impeccable service, Farfalla is bound to rise above the crowd of Italian restaurants in Southwest Florida." "The Spiedini Alla Romana was at once rustic and elegant. Like a little loaf fresh out of the oven, this combination of bread and mozzarella battered and fried had a crisp crust and a spongy interior, rich with cheese and egg. Its sauce married garlic and anchovies in a way that even a non-anchovy lover could appreciate. It's not to be missed." "The Ravioli of the day was lobster - with lobster sauce, no less. Rich, rich, rich. The tender pillows of homemade pasta puffed up with their contents, a simple puree that let the lobster flavor shine. On the side were lovely scalloped potatoes -thin, crisp and creamy -and julienned squash and carrots." 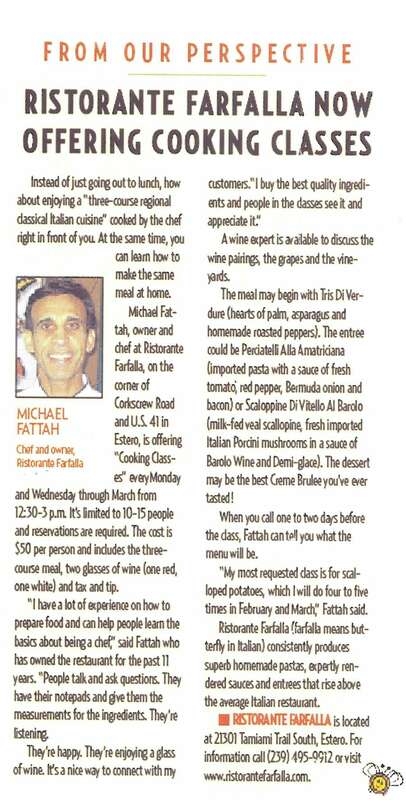 "It's good to know Farfalla - which means butterfly - still can soar with the best of the area's Italian Restaurants"